I am blessed to have many jobs in my life here on Earth, but without a doubt my most important and honored job is that of being a mother. God has blessed us with many children and even lots of grandchildren. Since I believe being a mother is a blessing and an honor I thought I would gather some quotes of what others are saying about mothers. 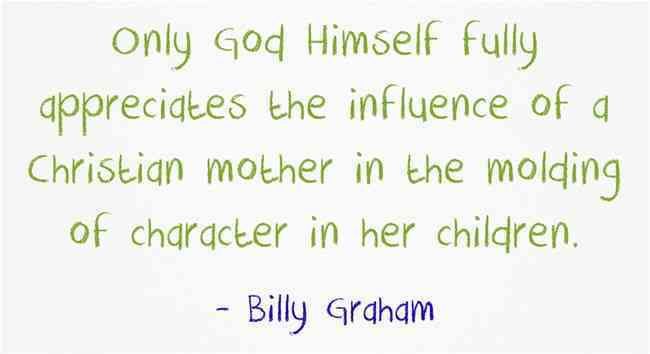 Here are just 21 great Christian quotes about and for mothers. Your mother’s voice is the first voice you ever hear – even before you are born. Even as a newborn baby, you know your Mother and prefer her above anyone else. Cherish your mother and be sure she knows you appreciate everything she does for you. The days are short, love your mother before time is gone. If your mother has already gone on before you, take some time to recall memories of her. Share these memories with your family so that she will live on in your hearts. 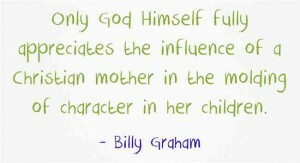 Do you have a favorite Christian quote about mothers that I did not include here? Leave it in the comments below, we love to hear from our readers. mothers plays an important role of every person life. It is the right time and best occasion to show your loved one on this day. I’m Dr. Satheesh Kumar, I just peeped through your site searching for Quotes on Mother’s Day! All quotes are relevant and inspiring!! Here I’ve two of my quotes, please include this to the Mother’s Day Quote in your site! Thank you! Here below are my quotes on Mothers Day! !